Brown ground beef. Drain beef using a colander. Press draining beef to remove excess fat. After draining ground beef, return to tilt skillet and continue cooking. Do not drain vegetables. 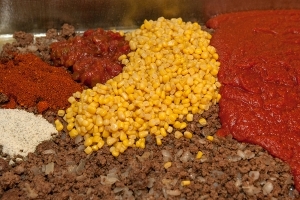 Add seasonings, water, crushed tomatoes, salsa, corn, and kidney beans to meat mixture and mix well. Simmer for 15 - 20 minutes. Transfer to steamtable pans. Serve immediately or cover and place in warmer until ready for service. Portion 1 cup soup with 8 ounce spoodle or 8 ounce ladle per serving. Each portion provides 2 oz. eq. 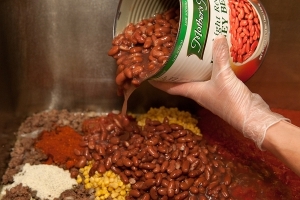 meat/meat alternate, ¼ cup beans/peas vegetables, ¼ cup red/orange vegetables, and 1/8 cup other vegetables. 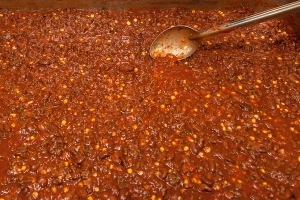 Salsa and/or Ro-tel tomatoes may be used instead of crushed tomatoes. Refer to USDA FNS Food Buying Guide for School Meal Programs for quantities to purchase if different ingredients are used. 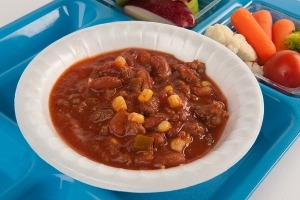 "Culinary Techniques for Healthy School Meals" provides seasoning and serving ideas for soups. Soup thickens as it simmers, so best if served within 2 hours after preparation. Garnish each serving with ¼ ounces shredded cheese (if cheese is added, nutrient analysis must be recalculated).